1. The CC salutes the members, friends and supporters of the party and KNE, its allies, all those who struggled and joined forces with it. The party received 5.6% of the vote and maintained its 15 MPs. These election results express the negative correlation of forces as a whole, the more general retreat of the labour-people’s movement in conditions of a deep capitalist economic crisis, the level of class struggle in our country and internationally. The KKE will utilize its political, electoral and parliamentary strength in the titanic effort necessary for the regroupment and strengthening of the labour movement, the people’s movement more widely, the strengthening of the people’s alliance, in order to reinforce the line of counterattack and rupture, of calling into question and opposing as a whole the capitalist development path, the EU and the political line that supports this path. The concentration of forces in this direction, the political emancipation of the working people from the false dilemmas and confusion fostered by the bourgeois political system, through the alternation of parties and political figures in various roles, is a precondition in order to militantly block anti-people measures and win partial gains, until the final overthrow of the capitalist system. In particular, we want to salute those who voted for the KKE for the first time, appreciating its consistency, its selflessness, its militancy in the struggle for the interests of the working people, even if they do not agree with all of its positions. We salute those who voted to acknowledge the fact that the KKE for many years and especially in the last seven months of the SYRIZA-ANEL government, against the current of expectations and false hope fostered by the change of government in January, revealed that on the terrain of capitalist dominance and the international imperialist alliances, like the EU and NATO, objectively there can be no management and negotiations in favour of the people. We address ourselves to all those, even if they appreciate the militant pro-people stance of the KKE, did not take the decisive step to vote for it, chiefly under the pressure exerted by the polarization and by a SYRIZA that asked for votes “so that we do not return to the past,” or preferred to abstain. The developments and the struggle of the Communists in Greece attract the interest of many workers in Europe and in countries around the world. 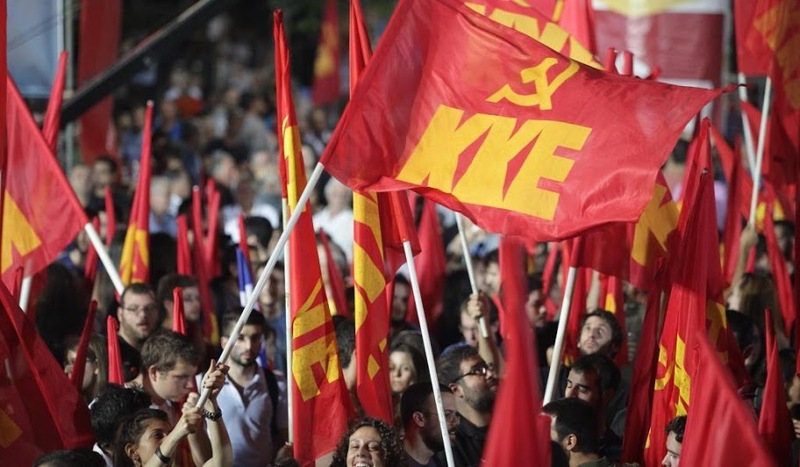 We want to thank the dozens of Communist and Workers Parties that expressed their support for the KKE, at a time when the Party of the European Left (PEL) and social-democracy in general continue to sow illusions regarding the role of SYRIZA and its government. 2. A large section of the people chose to abstain from these elections, the largest percentage of abstention in recent years. Even if to a large extent this expresses discontent with the bourgeois political system, a feeling of anger and disillusionment amongst sections of workers and youth, it is not an active stance that disputes and opposes the situation today and the causes that give rise to it. On the contrary, it strengthens defeatism and surrender with the rationale “that nothing can happen”, “nothing can change”, and it also reinforces the blanket and mistaken impression that “they are all the same”. Those who had sometimes voted for the KKE or thought about voting for it, but in the end chose to abstain, need to think about the fact that all the small and major battles, including elections, can and should be used to create fissures in the current negative correlation of forces, to gather forces with the aim of completely overthrowing the system. The level of abstention is also related of course to the difficulties that a section of the people found it difficult to travel, as they face real problems of poverty and survival, and from this standpoint the recent governments bear responsibilities for not taking measures to facilitate their travel, as the KKE had repeatedly demanded. We call on all these working class and popular forces, from tomorrow, to join with us in the everyday struggles in the trade unions, the sectors, in the workplaces, in the places where the youth are found, in the movement in order to repel the measures of the third and the previous Memoranda [set of austerity policies], for the recovery of the losses, and also more generally in the overall struggle to change the class in power. Through struggle and collective activity, hesitations and reservations can be overcome and the KKE’s proposal for the way out and for achieving power can be better understood. 3. The elections results in general express the consolidation of the retreat, passivity and intensification of conservative trends that are to be found in a large section of the people. The result is negative for the workers, employees, self-employed, unemployed, their children and pensioners. To a great extent, it reproduces the correlation of forces amongst the parties of the bourgeois political system that existed in the previous elections eight months ago. There continues to be the negative fact that Nazi Golden Dawn has formed a stable level of political influence. All the other parties bear serious responsibilities i.e. the governmental party SYRIZA, the official opposition of ND, as well as other minor opposition parties, which in essence did not wage an open political battle against Golden Dawn either in the election period or in the previous period. The KKE will continue to raise the banner of struggle against Nazism-Fascism and its representatives today in Greece, who poison the workers’-people’s consciousness, organize assault battalions, set up slave-trading offices to provide cheap workers for the employers, despite the effort to present a more “law abiding” visage, due to the criminal prosecutions that are underway. A certain reshuffling amongst the bourgeois parties, such as the rise of “Democratic Alignment” (PASOK-DIMAR) and the fall of POTAMI, reflect the ongoing process for the reformation of the bourgeois political system, from which the people can expect nothing favourable. The parliamentary presence of the “Centre Union”, with its positions that are in fact reactionary, is being used as a shock-absorber in order to trap some of the indignation that exists and render it harmless. The positions of the newly formed “Popular Unity”-which emerged from a split in SYRIZA and in the end did not enter Parliament- represent a political proposal for a way out from the crisis with a national currency, without in essence calling into question the capitalist system and the EU. 4. SYRIZA has provided valuable services to the system during this entire period. In the first phase, it utilized the discontent of the people concerning the anti-people measures, exclusively targeting the governmental management of ND and PASOK, the memoranda, concealing their real character, as policies to support capital in the phase of the capitalist economic crisis, which is an inevitable phenomenon of capitalist development. It tried to deceive working class and popular forces that its political proposal would have an allegedly pro-people-anti-memorandum orientation, that it is possible without ruptures and overthrows, without the people making sacrifices in the struggle, to achieve popular prosperity, because it is allegedly just an issue of negotiation, honesty, competence, intelligence. The signing of the 3rd memorandum by the SYRIZA-ANEL government and the hasty announcement of early parliamentary elections was accompanied by the renewal of the dilemmas in order to manipulate the popular forces and gain the people’s consent for the anti-people measures. In the run up to the elections, SYRIZA tried to foster the false impression that, in contrast to the previous governments, its government “fought”. It claimed that despite the compromise, the battle of the negotiations has allegedly not been completed, that the EU can change, that there are still open issues (adjustment of the debt, development programs, equivalent measures) which its government can better manage. In this way, SYRIZA co-opted working class and popular forces that in the previous years had fought against the anti-people measures and the memoranda. SYRIZA’s responsibility and that of its various dissenting offshoots is that it disarmed the movement; it undermined it with illusions and fraudulent promises. It most negative contribution in recent years is expressed by its elevation in the trade union movement as an employer-led bureaucratic force, assimilating the corresponding apparatus of PASOK and accepting the plaudits of a significant section of the capitalist employers and EU mechanisms. Consequently, SYRIZA prepared the terrain for the adoption of new anti-worker anti-people measures, both as the official opposition in the past and in the 7-month period of its government. The political line of SYRIZA allowed ND and PASOK to present themselves as being vindicated in relation to their governmental past. They are attempting to appear as genuine representatives of the EU one-way street, of the so-called “reforms”, of the investments for capitalist growth, which allegedly SYRIZA does not believe in. 5. The new SYRIZA-ANEL coalition government will proceed along the path of implementing anti-people measures and Memoranda in favour of capitalist profitability. It will implement the EU guidelines, which concern all the member-states. The bourgeoisie in Greece and at the European level, the EU mechanisms, the EU-ECB-IMF, the bourgeois parties want a parliamentary majority that will support a government capable of passing anti-worker and anti-people measures with relative ease so that the recovery can be facilitated and at the same time, so that the movement can be kept frozen, in a state of retreat. They will use the people’s votes as a sign of consent so that they can pass all the measures without resistance and implement their strategy with out any political cost. It seems that in this phase ND will keep its role as a harmless, fake opposition, a “responsible opposition” which will assist the government’s work and its accelerated implementation in the name of “stability” and “national unity”, which in essence means that the ruling class has a free hand in order to unleash its offensive, which means class collaboration and the intensification of authoritarianism. We have major battles in front of us regarding the burning issues that concern the working class and popular strata in their entirety (e.g. the social security system). The KKE will contribute with all its forces in order to organize the people’s counterattack, to orient the movement in an anti-monopoly, anti-capitalist direction, to lend mass characteristics to the movement and the struggles. The declarations of all the parties about equivalent measures, counterbalances and parallel programmes, which can allegedly soften the grave consequences of the 3rd memorandum, are obviously fraudulent. There will not be the return of even a small section of the losses experienced by the people in recent years. In the best case scenario, a section of workers will receive something, which will be paid for by all the other workers. The poor will pay to give something to those even poorer. The bourgeoisie and its governments will utilize the various equivalent measures in order to foster the rationale of “divide and rule”, the separation of the workers, in order to prevent the strengthening of a movement that will unite the workers with common and unified demands and fight against the pro-monopoly policies, capital and the EU. A prerequisite for even a lukewarm capitalist recovery is the maintenance and extension of the abolition of any gains, an even cheaper and more subjugated labour force, and tax havens for capital. Capital will drastically cut and abolish even the already low levels of social spending, while it will maintain a high-level of unemployment and semi-employment. The recovery which was witnessed in other capitalist states did not dramatically reduce unemployment, did not lead to a recovery of the people’s losses or to the abolition of the anti-worker and anti-people laws enacted during the years of the crisis. The people will pay for the adjustment of the debt, regardless of how and when this will happen, and also for the development programmes, which will be directed to big capital, precisely in the same way as the previous ones were. The situation could deteriorate, as the signs of the outbreak of a new international synchronized crisis are appearing and at the same time the contradictions between the imperialist centres are sharpening in our wider region. 6. The KKE, consistent to what it said before the elections as well, will not support or tolerate the new government. It will utilize the actual rallying of forces to do what it promised to the people: to be a strong workers’ and people’s opposition in the Parliament and above all in the movement, to strengthen the People’s Alliance that will fight concerning today’s problems but also for the future. The people did not give strength in order for us to exploit it by taking part in anti-people coalition governments that will implement the Memoranda, i.e. harsh measures at the expense of the people that serve the profits of the plutocracy. This stance of the KKE is neither easy nor “from a safe distance” as the other parties claim. The Communist workers’ and people’s opposition is a very difficult and complex task, and it entails a lot of sacrifices and responsibilities. However, it is the only stance that can exert pressure, create obstacles to reactionary policies and above all pave the way for radical changes and overthrows. It is this stance that serves the interests of the people and the workers and not the participation in governments that manage the system. The majority of the people and the workers, the youth, regardless of what they voted for, must not submit to the anti-people measures. They must reject the claims of the government and the bourgeois opposition that they consented to the implementation of the Memorandum. The intervention of the movement must hinder the adoption of measures and as the class struggle develops it can hamper the “stability” of the bourgeois political system, its ability to find alternative solutions, to create and utilize other shock-absorbers, to exhaust and disappoint the people, and to drag them in any direction it wants. The KKE will continue to fight for the political emancipation of the workers and the people, following the line of class struggle for the overthrow of the system. It will continue the tough ideological political struggle against the false demarcation lines “Memorandum versus anti-Memorandum”, “new versus old”, “the euro versus the drachma” that obscure the real demarcation line against the parties that defend the capitalist system. It will fight for the emancipation of the people from the conflict being waged over which are the more favourable conditions for capitalist development, a conflict that has nothing to do with the people’s interests and presents itself either as “productive reconstruction” or as “a national development plan” that will allegedly benefit the people. It will continue revealing the real demarcation line between capitalist power, the capitalist path of development and those that serve it on the one hand, and on the other, the class-oriented labour movement, the People’s Alliance, with the KKE in the frontline, that oppose this path. 7. The KKE utilized the electoral battle in order to underline the necessity to come into conflict with the capitalist ownership and power that are the cause of all the people’s problems, the decay that emerges in all aspects of social life: poverty, unemployment, corruption, including the creation of the increased flows of immigrants and refugees. It tried to promote the alternative solution, its proposal concerning the issue of power that can lead to a truly different, not merely alternative, and superior organization of the economy and society, with the abolition of capitalist ownership, with social ownership over the means of production, central planning, workers’ control for a constantly increasing people’s prosperity. Under these conditions the disengagement from the EU can operate in favour of the people with a unilateral cancellation of the debt and liberation from the vice of capital markets. Only in this way can the people prevent the worst and fight for the improvement of their living conditions. This proposal has been more deeply and widely discussed with the people. Our positions and our political proposal as a whole can be systematically discussed in the workplaces, in universities, neighbourhoods, utilizing the significant experience of the previous period. From the Central Committee to each basic party organization of the party and KNE [Communist youth organization] all comrades have the responsibility and the duty to continue the effort to develop militant bonds with new working class and popular forces, explaining the political proposal of the KKE to those who voted for the party in the elections.